I’m thrilled to be starting a new job as Executive Director of the Open Education Consortium. It is a tremendous honour to be chosen to lead a global network of educational institutions, individuals and organizations that support an approach to education based on openness, including collaboration, innovation and collective development and use of open educational materials. Map out how I see the current landscape of ‘Open’ and mention the most prominent challenges and opportunities. Define where the Open Education Consortium should be positioned within this landscape and propose a roadmap for getting there. As a means of getting to know my views and an early indication of the direction I’d like to take the Open Education Consortium in I thought I’d share my answers here in two separate posts. This first post maps out how I see the current landscape of Open. In the next post I describe where I think the Open Education Consortium is positioned in this landscape and how I envision it getting there. Before taking on this new role with the Open Education Consortium I spent five years working at Creative Commons supporting open initiatives all around the world. Through that work I developed a unique big picture view of the landscape of open. For the Open Education Consortium I decided to depict my map of the current landscape of open as a big one page visual. Here it is, Paul’s <a title="LandscapeOfOpenStacey"
As you can see I’ve adopted the landscape metaphor with a tree of open including roots below and branches bearing fruit above. Lets focus on the lower left part of the visual first. Cutting across the visual from left to right is a brown line representing earth. Above the brown line are established and growing components of the open landscape. Below the brown line are new germinating aspects of the open landscape. With this simple delineation I give a sense of what is already in place in the landscape and new emerging aspects of the landscape I think likely to grow. Above the line I show an open tree from which are hanging major established and growing components of the open landscape. As you can see the current open landscape is large and growing. I expect these kinds of open are well known so won’t expand on each with detailed explanations. Searching any of those terms will generate masses of follow-on information for those wanting to explore. If you are in education you might be wondering what all these broader components of the open landscape have to do with education. I believe all these components of the open landscape are inter-related. They are all concurrently happening and successful for very similar reasons. They operate on similar principles and generate similar value. They all have potential for educational use. I believe the combinatorial benefits of adopting multiple means of open are synergistic and generate a value greater than the sum of the individual parts. If your primary open efforts are around Open Educational Resources it is strategically beneficial to broaden your efforts to include open policy, open access, open GLAM, and other means of openness. Together they generate a greater value than they do apart and finding ways to connect and collaborate what you are doing with what they are doing can amplify impact and benefits. Below the line, I show several aspects of the open landscape, colour coded to relate to growing components above the line on the tree, that are taking root now and have potential to germinate into something substantial. While the growing components on the tree above the line are well known these germinating parts below the line likely need some explanation. So here goes. Open technologies – There are a growing number of software and hardware technologies that are open source and support open aspects of education. Equally important to me are the emerging technology tools aiming to enable citizen participation, help groups collaborate, and support processes for engaging people in collaborative decision making. Collectively these represent an emerging technology infrastructure for open. Going forward, I expect to see an open architecture of technologies integrating different tools and applications together to support the whole overarching open process. Open education data – Open data is an established, growing and increasingly important part of the open landscape. Governments in particular, at the national and municipal level, are generating significant new and improved services to citizens through open data and stimulating entrepreneurial activity by making open data available for business use. However, education data remains largely locked down and closed. I see big opportunities for improved education services and teaching and learning itself through open education data. Key for me will be student control of their own data, privacy, security, and direct tangible benefits to those who choose to make their education data open. Open institutions – Over the years we’ve seen Open Educational Resources start as small learning objects within a course, expand to include textbooks, expand again to encompass entire courses, and expand again, as we are seeing now, to include entire degrees (Z degrees). Going forward I anticipate a growing number of institutions will adopt openness as an underlying component of all their credential offerings transforming themselves into open institutions. Open enterprises – Over an 18 month period I co-wrote, with my Creative Commons colleague Sarah Pearson, a Kickstarter funded book called Made With Creative Commons. This book examines the ways organizations are currently participating in open landscape activities while still generating revenue and sustaining operations. Open enterprises embrace openness as a key strategy and look to use it as a means of generating social and economic good. In the education sector open enterprises are largely in the germination stage. Some have poked their heads up above the earth but many more are still working out how to be an open enterprise and how to ethically engage with and participate in the open community. I think this will work itself out in the next few years leading to even greater growth above the line. To the right of the open tree I’ve highlighted and expanded on aspects I believe most relevant for the Open Education Consortium. For open government I simply list a few different government related organizations currently active advancing the open landscape particularly as it relates to Open Educational Resources – UNESCO, the Commonwealth of Learning, and the Open Government Partnership. There are many more that could be added. The Open Education Consortium has an advocacy and advising role to play on behalf of its members with government. Open government often results in open policy at the national, regional, and institutional level. The Open Education Consortium brings to the table existing open policy examples, templates, and tools fostering adthat can be adapted for use in any particular country or initiative. Given the Open Education Consortium members are primarily involved with Open Educational Resources (OER) I have built out that aspect of my open landscape the most. Above the brown line I show the large and growing aspects of Open Educational Resources including open courseware, open textbooks, open courses / MOOCs, open degrees (Z degrees), and open research. Each of these can be thought of as a young plant sown from seeds off the large open tree. If I was to summarize I’d say there is a lot of of really great stuff happening across the Open Educational Resources landscape. When I think back to my beginnings in this space in 2003 the transformation and growth is amazing. But there are still a lot of things germinating below the line. I could say a ton about all these aspects above and below the line but I won’t. If you want to hear more about my views and what I’m seeing related to each of these components contact me. We can have that conversation. 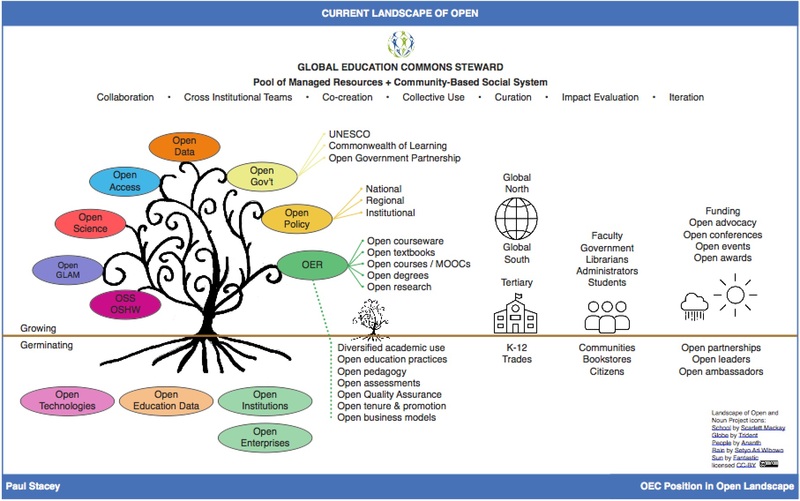 From a big picture open landscape perspective, and especially looking at the members of the Open Education Consortium, a key observation is that Open Educational Resources work is being done in both the global north and the global south. OER are not some new form of colonialism, rather they are a new form of community empowerment – affordable, participatory, and powerful. Growing above the line are OER at the university and college level. Germinating below the line are OER initiatives at the K-12 level and for vocational trades related areas. As the use and benefits of OER expand to these broader academic contexts the membership and advocacy role of OEC can expand too. But these are fast coming. At the end of January 2018 I’ll be speaking to Campus Stores Canada about open business models at their annual conference. The Open Education Consortium needs to be a place for all of these participants. OEC is playing a key role in all of these. Nominations for OEC’s Open Education Awards for Excellence are open now. Awards will be given out at their OEGlobal Conference in Delft Netherlands in April. Somewhat surprisingly there isn’t a lot of collaboration between different open organizations so I’ve put open partnerships below the line as something germinating but something I think OEC could play a lead role in generating. Formal means of becoming an open leader or ambassador are just now being developed so I’ve placed them below the line as germinating too. Well there you have it, Paul Stacey’s one page visual of the current Open Landscape. I hope you find it useful as a framework for seeing the big picture. The very top part of my one page visual depicts my answer to where the Open Education Consortium should be positioned within this landscape and proposes a roadmap for getting there. In my next post I’ll explain and expand on what I show there proposing a rather unique view of OEC’s position and potential role.